If you click on it, it will enlarge so you can read the text. However, to summarise, it's a local library project - a shelf of plain-wrapped books for loan, no titles or authors on the wrapping, just odd words suggesting themes. It reminded me of the time the Ex and I were in a wine club. Basic membership mean signing up for a minimum order - which was one case of wine every three months, delivered to the door. As starter packs, they had three different price levels of these cases, and within each price bracket, you could choose a mixed dozen of reds, whites or half and half of each. So, every three months, this box of wine would arrive, with a few pages of tasting notes. Some of them were labels that were familiar, but some we'd never heard of. It meant, of course, that we drank wines that we might otherwise not have discovered. Being part of a book club is a little bit like that too, in that over the course of a year, you end up reading a book a month, many of which may not have been on your 'would like to read that' list. I just launched myself into a bit of the unknown by buying a handful of books on the basis of a couple of lists compiled by the literary writer at The Hoopla. I've blogged about one of them already - you can read about that here, as well as some info about that website - am partway through writing a post on the second, and have just started reading the third. Now, those lists came complete with title, author and short blurb, so I chose my selection on the basis of what appealed. Sam, over at Tiny Library, has just been reading through books published by Peirene Press in a readathon of their books. Now, I may have this quite wrong, but in the course of following odd posts by Sam and some of the others doing the challenge - or, actually, it may have been on another post altogether...I have a vague memory of there being a query on a book blog by a reader as to how to expand their reading experience. Hmmm... Anyway, from what I recall, you can sign up to Peirene Press, and you get sent a book a month - or something like that. Perhaps someone out there in the blogosphere can clarify that for me? My point being, of course, that a random book is going to land in the letter box every month that you haven't chosen for yourself - which forces you to read something you might not have otherwise. With reading, as with anything else, it can be easy to get into a comfort rut - especially if there is no imperative to push past it. Study makes us read - no matter what the subject matter, there are texts and background materials to read. Signing up to the many challenges via the plethora of blogs is another - I've not done that... 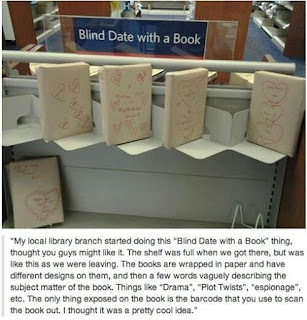 But I do think this plain-wrapped book idea at the library is a brilliant way of just diving in there. Hi, Kaz! I totally get you when you said that bit about being in a book club. As a member of one, I've discovered lots of wonderful books, most of which I would never have picked up myself in a bookstore. 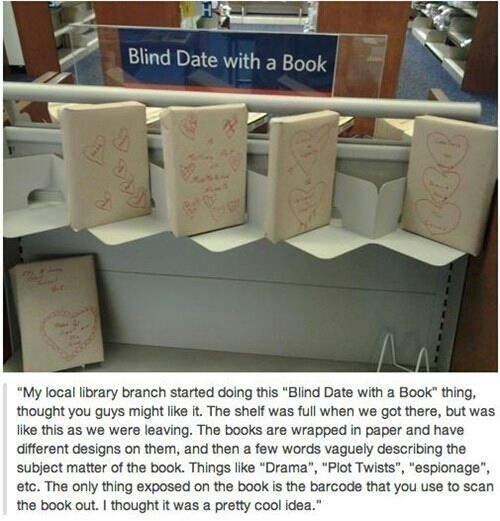 But as for the blind date with a book thing, it sure looks fun! We all should live a little dangerously every now and then, no? Do you know, Peter, in my entire reading history (AKA...my life), I've never belonged to a book group. I did belong to a book club that centred around a particular series of vintage English boarding school books, but we were all reading the same stuff, and if there was a new author to discover, by and large, it was in a similar genre.